Posted on October 6, 2016 at 11:30 am. 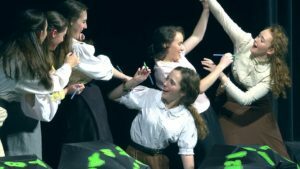 The Educational Theatre Association recognizes schools whose theatre programs exemplify and promote high standards of quality in educational theatre. This year, Yorktown joined two other schools across the nation to receive the recognition. The Yorktown theatre program, under the direction of Carol Cadby, was cited for its distinctive approach in focusing on ensemble, experimentation, and original work, which enables students to develop high-quality, creative theatre that challenges and excites both the actor and the audience. The program was commended for the way it enhances the entire school curriculum, as well as for its inclusivity and success in supporting students of all abilities. It has developed a strong network of partnerships, including the League of Women Voters and Association of University Women, and robust community outreach using both performances at other schools and online and local media outlets. The Educational Theatre Association (EdTA) is a national nonprofit organization with approximately 100,000 student and professional members, representing approximately 4,500 schools. EdTA’s mission is shaping lives through theatre education by: honoring student achievement in theatre; supporting teachers; and influencing public opinion that theatre education is essential and builds life skills.